What life dwells in the ponds surrounding MPavilion and how does it determine the health of the water? Why are leaves shaped the way they are? Why are plants and trees important? What action can you take to help make a positive difference to the planet? Come one, come all intrepid ecologists in the making! Discover the complex ecosystems teeming within the Queen Victoria Gardens in this plantastic opportunity to connect with nature and the many critters within. 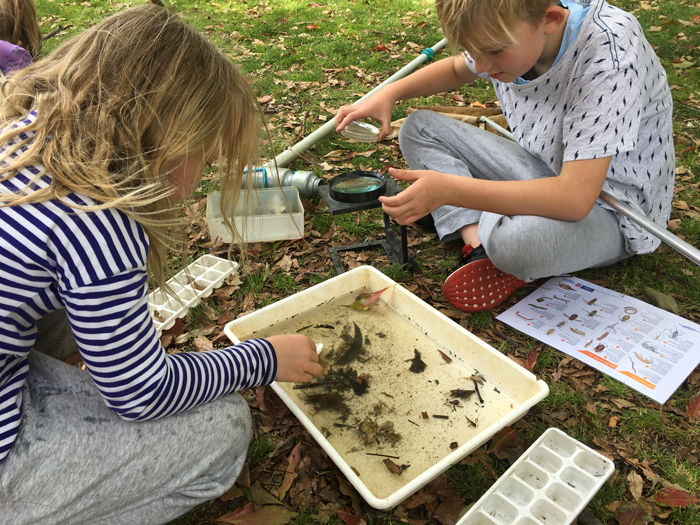 Join experienced Bug Blitz presenters Erin Nowak and Deirdre Marshall as they lead an exploration of the ponds with nets and microscopes, and guide you in the creation of Earth Balls and leaf press tiles—take a little nature home with you! All activities will be run to accommodate drop-in participants except the Waterbugs workshop which, for water safety reasons, will run to a schedule. A list of netting times will be displayed on the day. Waterbugs workshop: What lurks in the water? The answer: macroinvertebrates—creatures so small you need a microscope just to see them! We head down to a nearby pond, nets in hand and microscopes ready, to view the life in the pond and assess the water health, testing for pH, salinity and turbidity. Chamber Made: What do insects say and how do they sound it? Imagine what a bug might communicate about finding food, sensing danger or looking for a mate—drumming, chirping, buzzing, hissing and even light can be combined to build soundscape architecture, a bug boogie if you will. Using traditional percussion instruments and those created from found objects or the surrounding environment, you’ll layer up bug rhythms for a bug groove, creating a biodiversity opera that mimics the percussive sound of bugs—join the bug band and go for a caterpillar walk! Earth ball workshop: Get mossy! Learn how to make your very own hanging garden and get a feel for the earth. Leaf tile pressing workshop: Discover the complex lives of leaves in a hands on exercise where pottery + plants = good times. All kids are invited to attend this free Bug Blitz workshop (with guardians in tow) at our place in the gardens, and you can pop-in for one activity or the whole day. And remember: Be great. Be like a bug!